The principal guest and the representative of the Grand Superintendent was Christopher Blackwell who is also the Chairman of the Leyland Group of Lodges and Chapters. The evening was also graced with the presence of Assistant to the Provincial Grand Principals Tony Hall, along with Chairman of Chorley Group Peter Lockett and five other grand officers and five acting Provincial grand officers. 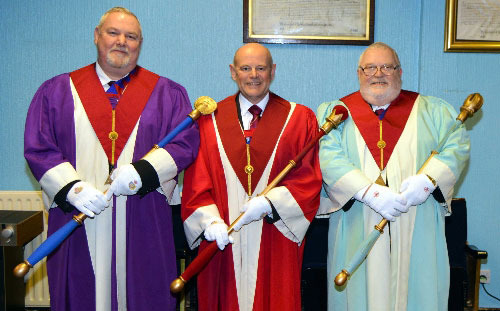 Once the three principals had been installed, the robe addresses were expertly given by David Worth, Ken Bowker and Roger Sherlock to the first, second and third principals respectively. The three addresses to the principals, officers and companions with given by Ken Shaw, Ian Banks and the representative Chris Blackwell, all of which were extremely well delivered. 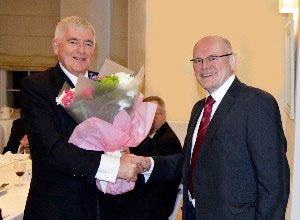 Steven (left) presenting Chris with a floral gift. After the ceremony was complete, Chris Blackwell brought the greeting of the Grand Superintendent Tony Harrison and congratulated all the companions who had taken part on a job very well done. Traditionally on such occasions a number of charity donations were presented to Chris, who reported that £500 had been presented to the MCF 2021 Festival which resulted in Malcolm Warren presenting a Patron’s certificate to the chapter. Further donations included £50 to the West Lancashire Freemasons’ Charity, £100 to Friends of Firwood School, £100 to Friends of Ecclesholme and £230 resulting from the companions giving throughout the year in the white MCF 2021Festival envelopes. This made a grand total of £980. On behalf of the Province as well as all those who will ultimately benefit, Chris thanked all the companions for their generosity.